Lulupu - The Craft Lounge: Loaded with Gardenias!! + A Tutorial.. 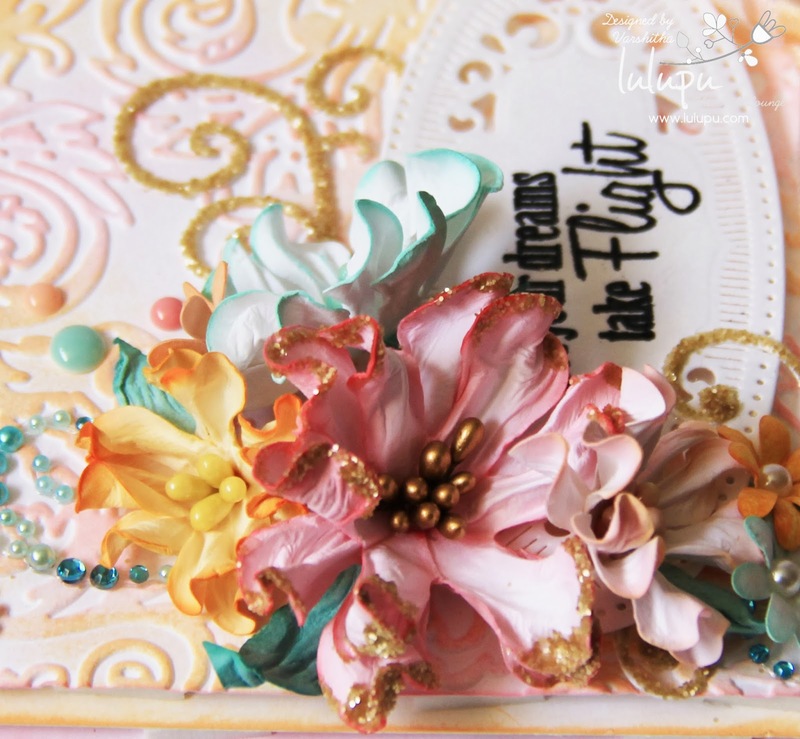 This challenge demands minum 3 layers and 3 embellishments and here's what I have done. The base is an inked layer, the 2nd layer of white CS is also inked. 3rd The layer is of embossed card stock and I have inked it using Distress Inks giving a double shaded look. I don't know if someone has done it, this idea just came to my mind when inking the embossed CS. I used two colors to give a gradient shade look, where these two colors where the ones I used in the flowers. 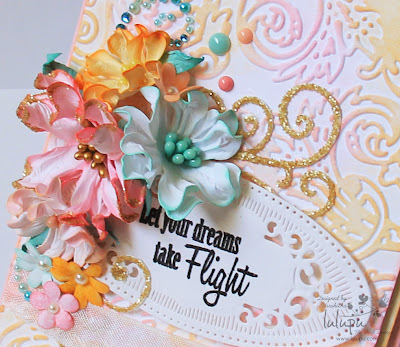 (Dried Marigold and Spun Sugar) and the last layer is the decorative diecut with the sentiment saying "Let your dreams take Flight". I used this sentiment having in mind my close friend who got engaged last week. Wish I could send this to her all the way in India. Here are the embellishments I have used..
5. Seam binding ribbon shaded with same two distress inks as final touch. Hope you like my card for today. 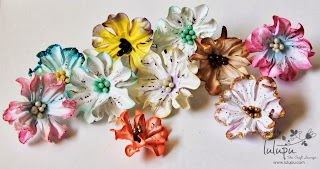 I have also made a video tutorial on making easy paper Gardenias. Before watching the video, I would suggest you to read the supplies needed section below. Thickness of 95 - 100 gsm (Apx 65 lbs) should be perfect. Do check the flexibility and smoothness of a small piece of card stock by folding it twice or thrice and dipping in water and squeezing out the excess water. The CS should be perfect for crushing and tweaking, if it seems to be too mushy, it means it is too thin. If it is stiff and does not merge well, it is either thick or the CS is not absorbent so its not a right one. So always die cut or punch out from two or three different CS and try it to find the best for any florals. Pick out floral punch or dies with similar shapes which ll be apt for this particular Gardenia. Make sure it is 4 or 6 petaled one, which ll be easy for this folding method. Mine is a Digital die cut which i made according to the size I wanted. The big one (pink gold glittered) is 2.2" and the small one is 1.45" (Yellow orange gardenia). I made the hole in the centre in the die itself because piercing after the flower is made is so tough for me. For all lazy crafters like me the tip is to punch a center hole after you die cut or punch out which ll make things easy. If you use a digital cutting machine and you want this same die cut design. Please comment and ask me the file, i can email you the .svg file. This is the design i picked from my softwares library uploaded by some anonymous user. Take any sprays, ink pad or re-inkers which reacts with water. Distress Inkpad, Colorbox Pigment ink pad, Dylusion sprays worked out good for me. Do try out others too. Tell me what worked out best for you. Typical centre embellishment I prefer for gardenia are Pollens/Stamens, you can also try DIY glittered stamens, flocking powder, Beads, Micro beads, etc. Like TomBow, Glossy Accent, Glue Gun or try any glue which your confident about. Having my little one around I was not able to complete and upload the video with the post. Finally here i am with the Video.. This is my first video and i am super excited. I really thank lulupu and team, who is soo encouraging. Aww....super awesome fresh gardanias Varshitha. Thanks for mentioning. I'm waiting to see ur video...i might learn something new. Gorgeous card .. blooms are so stunning . Can't wait to see the tutorial! Thanks in advance. 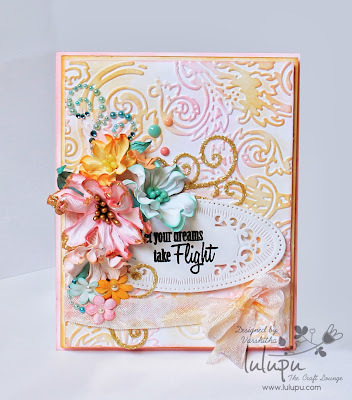 SUper gorgeous card n the blooms are so beautiful ..I am waiting to see the video tut !! Hello Team Lulupu ! I followed Varshitha's tutorial and made the flowers and shared them on my fb page and other groups today and wanted to inform that I have linked this tut with the snaps.Thank you ! Loved the video tute Varshitha!! Your voice is so sweet :) I liked your technique to make Gardenias. Will definitely try it out. Thanks a lot for sharing. These are beautiful. I would love to have the die. I have tried to make one and can't get it right. Email is crazycraftyduo.com. Thank you so much. this is the svg file i made it with , please download it here. I just love your flowers.they are just beautiful.the best ones I've seen on utube.i am going to try these tomarrow. I love the flowers - can you send me the file please ? which embossing folder do you use for this card ?